Print a shark of your choice. Laminate. Print sight word cards of your choice. Laminate. 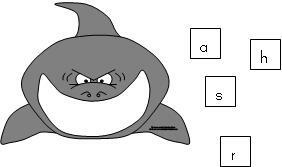 letter tiles by placing the tiles in the shark's mouth. Here is an Amazon link for the letter tiles.